Gold Jewellery of the Indonesian Archipelago features more than 500 stunning, never-before published examples of tribal, ethnic, ancient and courtly body ornaments from Indonesia's outer islands – Sumatra, Borneo, Sulawesi, the Lesser Sunda Islands and Maluku. 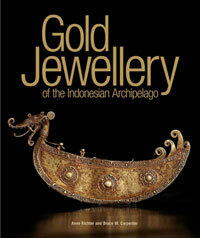 Written by Anne Richter, author of Arts and Crafts of Indonesia and Jewelry of Southeast Asia, and Bruce Carpenter, acknowledged expert with more than 20 years of experience in the field of Indonesian art, history and culture, and more than 16 books to his name, this volume provides a compelling introduction to the little-known visual power and beauty of Indonesian jewellery. Illustrated with archival artwork and maps as well as photos of carefully selected rare ornamental adornments, this book also traces the historical origins of Indonesia's remarkably diverse culture and peoples.